Home > Trampoline Combos > Round Trampoline Combos > “SKYTRIC” 15 FT. Trampoline with Top Ring Enclosure System equipped with the “ EASY ASSEMBLE FEATURE"
“SKYTRIC” 15 FT. Trampoline with Top Ring Enclosure System equipped with the “ EASY ASSEMBLE FEATURE"
Bring bouncing fun to your own backyard with this new “SKYTRIC" 15 FT. Trampoline with Top Ring Enclosure System equipped with the "EASY ASSEMBLE FEATURE". This “SKYTRIC” trampoline will let you reach the sky for maximum fun and fitness! Top Flex Pole Enclosure System offering amazing stability and durability verses regular poles which enables the net to stand tall and straight! Get this SKYTRIC trampoline and you’re in for the bouncing experience of your life! 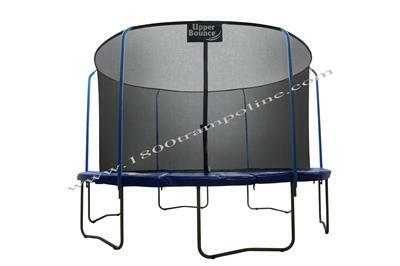 Enclosure Net Installs inside the Trampoline for maximum safety. Net attach to bottom with rope and clips and has special connector on top to keep things in place.